Wimbledon, the world’s most famous tennis tournament, is a gem in the British sporting calendar, so celebrate it in style at Harvey Nichols Fifth Floor Restaurant. 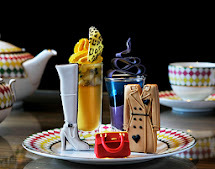 Afternoon Tea is a cherished experience steeped in British tradition but will be particularly popular in the capital this year as we host an array of events. We are starting the sporting season with a special Wimbledon Afternoon Tea in which you’ll receive a glass of refreshing Pimms, followed by freshly baked scones with strawberries and cream, all perfectly suited to Wimbledon. The Wimbledon Afternoon Tea is available in the Fifth Floor Restaurant Monday to Thursday from 3pm until 5.30pm, Friday to Saturday from 3.30pm to 5.30pm and Sunday from 3pm until 5pm and is priced at £29.50, including a glass of Pimms.